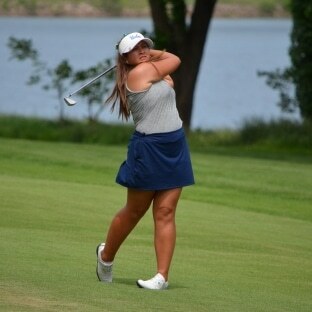 STILLWATER, Okla. –– A day after Wake Forest’s Jennifer Kupcho set a Karsten Creek course individual record with a 7-under 65 in the first round of the NCAA DI Women’s Golf Championships, UCLA combined to set a new team record on Saturday to propel the Bruins to the top of the team leaderboard after 36 holes. UCLA teamed up to shoot a 9-under 279 in Saturday’s second round, jumping into the leaderboard’s top spot and shattering their own course record of 287 set on May 10, 2014. Currently sitting at 3-under, the Bruins ended the day under par for the tournament, followed by second-place Alabama (+2) and third-place Southern California (+13). The Trojans lead the field after Day 1. The Bruins boasted two players in the top five on the individual leaderboard and three in the top 13 after the first two days of action, led by Lilia Vu who shot a 68 in her second round to end the day in fourth overall at 4-under. Alabama turned in the only other sub-par round on Saturday, using a pair of 69’s from co-leader Cheyenne Knight and ninth-place Lauren Stephenson to shoot a 2-under 286. Along with Knight, Kupcho and Arizona’s Bianca Pagdanganan are also 5-under for the weekend heading into the third round. Pagdanganan posted a 4-under 68 on Saturday. After bogeying two of her first five holes to open the day, Pagdanganan bounced back nicely with four birdies over the final 13 holes to go along with an ace on the par-3 11th. A little over 24 hours after turning in a stunning 65 in her first round, Kupcho maintained her position at the top of the leaderboard Saturday. Following a tough stretch on the front nine that put her at 3-over at the turn, the Demon Deacon carded a pair of birdies to only one bogey on the back nine to finish the day with a 2-over 74. Round three of stroke play at Karsten Creek will tee off Sunday morning at 8:30 a.m. ET. At the conclusion of play, the field will be cut to the top 15 teams and the top nine individuals not on an advancing team to compete in Monday’s fourth round.